Experience the talent and energy of the most exciting artists and creators at Tokyo Midtown! »SOUND meets ART @ "Roppongi Art Night"
A dream-like world of video art will appear in Canopy Square – the entrance to Tokyo Midtown. Come and experience a new kind of video expression by the internationally acclaimed visual design studio "WOW." WOW is a visual design studio based in Tokyo, Sendai and Florence. It is involved in a wide range of design work, from advertising and commercial works to installations for exhibition spaces and collaborative projects with manufacturers to develop new user interface designs. Recently it has become passionate about creating original artworks and holding exhibitions not only in Japan but also internationally. WOW tries to capitalize on the sensibilities of each of its designers to realize the new potential of video and make visual design functional within society. 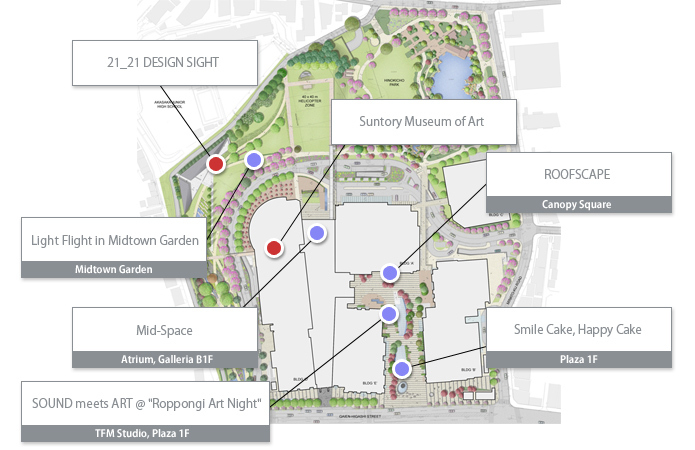 Artists and creators from around Japan and the world will gather in the Tokyo Midtown event space, "Atrium." Come and enjoy a performance that mixes a wide range of creative activities, in particular music and video. Tokyo has reason to be proud of its next generation of creators. We urge you to witness their talent and energy for yourself. [Interior design] Recycled woods thinned from forests are adopted for the stage. You can enjoy all performances in the eco-friendly atmosphere with invigorating scent of the woods. All woods are recyclable therefore it leads to a reduction of waste to a large extent. This gives us insights how the events in the 21st century should be in terms of environment. * Entrance restrictions will apply if the venue reaches full capacity. "Classic Act" is a series of free concerts held in Midtown each month with the aim of making classical music more accessible. During "Roppongi Art Night 2010," under the banner of "Classic Act in Mid-Space," a series of unusual performers will appear, including a 25-string koto (Japanese stringed instrument) player and two twin brothers who give four-handed piano performances. These original performances convey the attraction of classical music. Karin started to play the Japanese 25-string koto at 12 years of age, and made her debut as a professional performer with an original score when she was 14 years old. Karin studied the classic 13-string harp using the Ikuta method at Tokyo University of the Arts. After graduation, she started to sing to her own playing on the 25-string koto and also collaborated with many artists from various genres. With her unique koto she is able to play versatile scales very different from Japanese classical harmonies, and she can create both bright sounds to dance to and also relaxing night-time melodies. Chihiro and Michiru are twin brothers who play the piano. "Jumelles" means twins in French. Their basic style is to play together on one piano. They have performed widely, occasionally adding extra keyboard instruments in order to convey the beauty of classical music and four-handed performances. In February 2001, the artist released the album “Dummy Variation” and 7 inch “Just One Fix” under the name of Joseph NOTHING from the μ-ziq label, Planet-μ. It was highly praised by the major British magazines NME, WIRE, and so on. In July 2002, NOTHING released his second album, “Dreamland Idle Orchestra,” and, in July 2003, he released his third album, “Deadland after Dreamland.” After a short hiatus, he recommenced his musical activities after meeting contemporary artist TAKANO Aya and drummer YOSHIKAWA Dan. Artist and illustrator. In 2005 Kaz started his career as an artist. He is now active domestically and overseas. He held his first solo exhibition overseas at Compound Gallery, Portland (USA) in 2008. His work now consists mostly of live-painting and wall-painting performances. He is involved in an ongoing quest to pursue his own style of drawing and the full potential of creative expression. Sound performance group. “Pricks: four connect walls” is a work where they make music using 126 electrical sockets – kind of like patching a synthesizer. Music group active since 2009. Open Reel Ensemble uses old reel-to-reel tape recorders as instruments. They record voice and sounds impromptu using reel-to-reel and control the reel's speed and movement with a computer or directly with their hands. WADA Ei leads four other musicians: SATO Kimitoshi, YOSHIDA Haruka, NAMBA Takumi, YOSHIDA Masaru (bass). As an Artist, Takano has held exhibitions in several cities around the world including Tokyo, London, Paris, and Los Angeles. In 2009, she had a solo exhibition titled "Reintegrating Worlds" at the Skarstedt Gallery, New York and published a comic book titled “Cosmic Juice”. In 2010, she did the artwork for Joseph Nothing's music album“Shambhala Number Two & Three” She has also made several appearances in his live performances as a VJ. She is now expecting solo shows at the Hong Kong International Art Fair and the Museum Frieder Burda in Germany scheduled respectively in May and September. Sound artist. Interested in the effect of sound in various environments. Holds performances and creates installations at various events and museums both in Japan and abroad, including at events such as Fuji Rock Festival and Sonar. SAWI produced Aco's album “irony.” Other activities include giving lectures, writing, sound design and other sound projects. The underlying principles of MANABE's works are strong programming, good research and a flexible stance. He has participated in all manner of various projects in Japan and abroad. MANABE performed a work on which he collaborated with Zachary LIEBERMAN's YesYesNo at the Ars Electronica Center Opening event in January 2009. His experimental movie, in which he used his face as a music visualizer, received one million views in less than one month on YouTube after it was picked up by geeky blogs. DJ/ Music Producer. Started his career in NY, playing at party for Tommy Hilfiger, Chaumet, Carrera y Carrera. Playing and making music in varierty of sounds from all over the world, past and future. Enjoy your voyage with what so called "Taromix". He dicided to take part in the music world in the early 90s inspired by various DJs and musicians in tokyo. After involved in several bands and thier live perfirmances,he is currently a DJ for many parties including BANK!, R.O.T.F, Quiet sundance,Life force and many underground party. He gradually began to produce his own tracks, and one of them was selected for the "TURBO SONIC" compilation. It seem like this album is selling very well. Graphic design, photograph, and illustration are produced besides music. It positively participates in the exhibition etc.The artwork has been submitted to magazine remix since 2006. Raised in San Diego California, Ben came to Tokyo after graduating from the University of Southern California. After several years as a freelance art director and video director, Ben established the animation and motion graphics company "Chroma*Fresh" in 2000 and the VJ/art unit "DaDaKingZ" in 2005. Personal and group activities include numerous commercials, on-air promotions, music videos, fashion events, concerts and performances all over Japan and numerous cities across the planet. To commemorate Tokyo Midtown's Third Anniversary: a giant objet d'art! This spring Tokyo Midtown celebrates its third anniversary. To mark the occasion, a giant art object, "Smile Cake, Happy Cake" will be installed in the Plaza zone. A part of Midtown's spring event program, "Midtown Blossom 2010," the object will be on display from Saturday, March 20 until Sunday, April 4. See the Midtown website for more details.